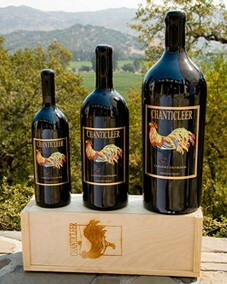 Wine Lamp converts a Chanticleer wine bottle into a long burning lamp. The wine bottle lamp converts an empty Chanticleer wine bottle into a charming, long burning lamp once filled with paraffin. Morningside Vineyard fruit has a characteristic cherry-plum aroma, typical of the great Cabernet growing regions of Napa Valley. Ripe cherries and currants are evident in the aroma and on the palate. It is a harmonious blend, comparing favorably with not only the great Cabernets of Napa Valley, but the great Super-Tuscan wines of Italy. This wine will age well for 10-15 years, and is well suited for pairing with dishes ranging from aged cheeses to roast beef, steak and lamb. Handpicking, gentle destemming and open-topped fermentations with a combination of soft pumpovers and hand-maceration, typify the winemaking process. After a 36 day maceration period, the wine was lightly pressed and transferred to a combination of 75% new and 25% used, small French oak barrels. It was gravity racked over the 24 months in barrel; decanted for clarity and freshness. It was bottled unfined and unfiltered on August 23, 2003, and given nine months bottle age prior to release.